serves as our primary teaching venue. 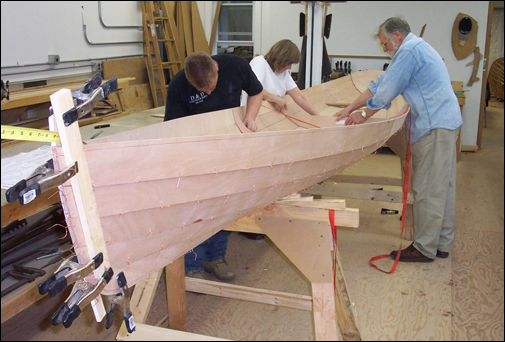 It is a thoroughly modern boat building facility which consists of a 40'x25' shop with appropriate machinery and hand tools, a 31'x25' meeting/project room and an office/tool crib. 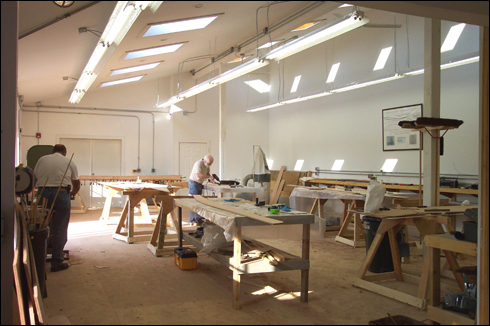 The Center also has a 36'x16' shop in a separate building which is utilized as a boat repair/maintenance shop. 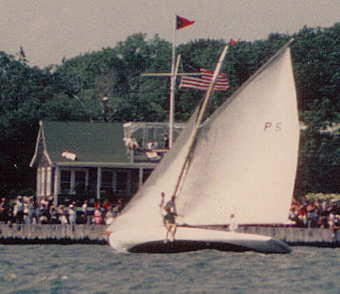 Adjacent to it is a 40'x16' 'tent' enclosure that houses Elvira, a 'P' class sloop built by Gill Smith in Patchogue in 1906. Elvira (below) is undergoing refurbishment to serve as fleet "flagship" of what will become the Maritime Center's Boat Livery.